New York-based AfterShokz, a headphone brand known for its patented bone conduction technology, have released its new sport headphone, Trekz Titanium. Designed to ensure the ultimate level of awareness and comfort—without compromising on sound, Trekz Titanium are wireless, open ear sport headphones made to ensure safety, perfect for runners, cyclists, hikers and more. Trekz Titanium uses the company’s PremiumPitch+ patented technology to deliver decent sound quality, delivering dynamic range and powerful bass using just bone conduction. Trekz Titanium drivers are placed on the user’s cheekbones, just in front of the ears. Bone conduction technology transmits audio waves to the inner ears through the skull, bypassing the eardrums completely. This leaves ear canals open, allowing users to remain alert and aware of ambient sounds while they enjoy the music. At the same time, Bluetooth (v4.0) connectivity gives the Trekz Titanium ability to be free of wires and make and receive phone calls. AfterShokz’ bone conduction technology was initially developed for military special operations and law enforcement by Voxtech in 2001. Through a suite of proprietary audio technologies and the only completely open ear design, AfterShokz adapted the concept for sport, mobile and Bluetooth headphones designed and priced for everyday use. 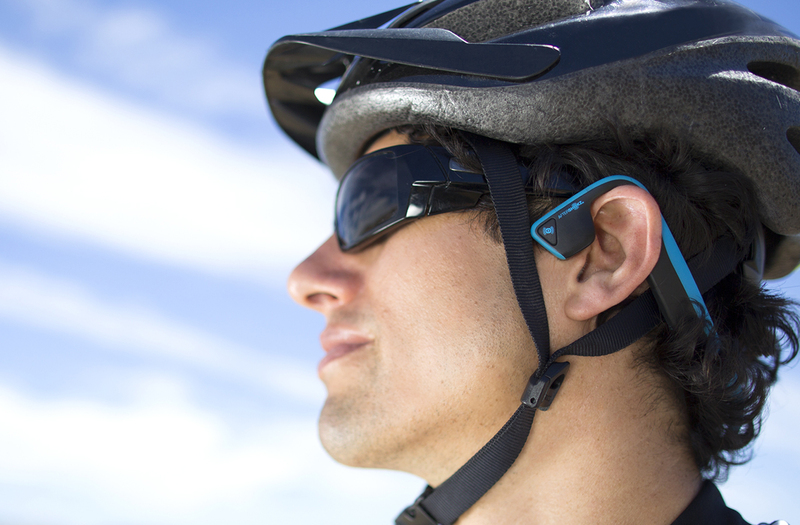 According to AfterShokz the new open ear design (OpenFit) allows for uncompromised awareness and extended comfort, allowing users to listen to music or take a call, while staying safe and alert. Bone conduction audio has earned its bad reputation due to a blend of natural sound leakage and weak bass. 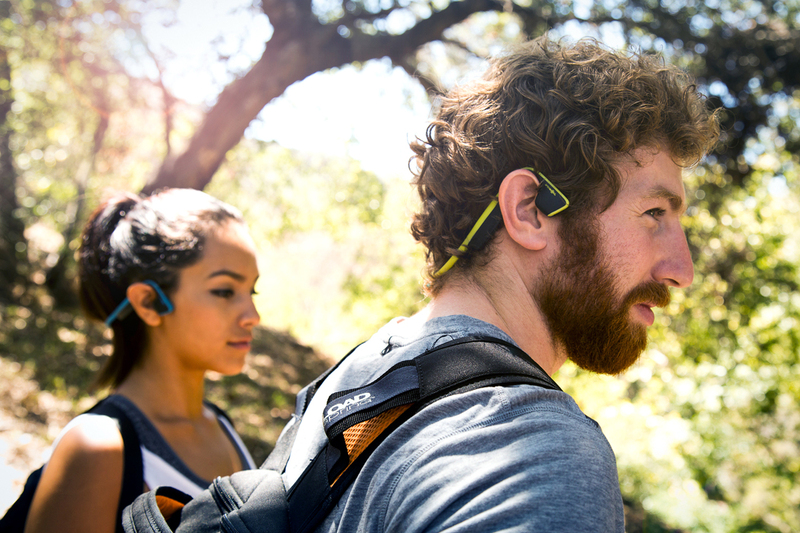 AfterShokz’ PremiumPitch+ technology optimizes the sound and ensures music is directed exactly where it should be. Precisely placed dual noise canceling microphones also exclude surrounding noise, effectively enhancing speech. Another interesting feature, especially for an activity device is the voice guide. Audrey Says voice prompts guide the user through power, pair, play and talk, while a multifunction button provides complete control of music and calls right from the unit. The backbone of the industrial design is a premium titanium frame, an element chosen not only for its strength and durability, but also for its infinite flexibility. Available in Ocean colourway (Blue/Black). Built to power through daily sweat sessions and wicked weather, the Trekz Titanium is IP55 rated to repel sweat, moisture and dust.